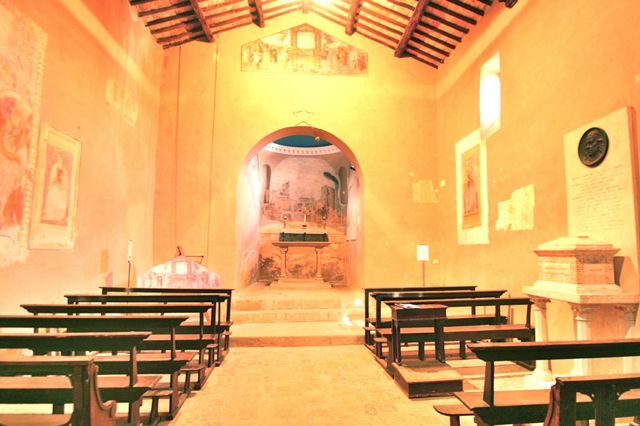 Last week I was passing through the village of Fontignano, just south east of Lake Trasimeno when I saw signs for the paintings and tomb of Perugino outside a small church in the village. Born in nearby Città della Pieve, Pietro Vannucci was nicknamed Perugino because much of his life was spent in Perugia where you can still see many of his works. Perugino was the teacher of Raphael and he (Perugino) had been taught by Piero della Francesca. In the late 1400’s and the first few years of the 1500’s Perugino’s work was in demand all over Italy. After that time his work fell out of fashion as he was unable to compete with the paintings produced by his former pupil, Raphael, and another great artist of the high Renaissance, Michelangelo. If you look at many Raphael paintings and you are familiar with the work of Perugino it is very easy to see the influence. I’ve probably written this elsewhere, but it’s worth noting that the term Pre-Raphaelite was given to the Victorian school of painters because they regarded Perugino’s paintings in such high esteem. According to the first art historian, Giorgio Vasari, Perugino had a large workshop and was prepared to put his name to work carried out by assistants, this diluted the quality of much of his work but fed his large appetite for earning money. Vasari also claims that Perugino was an atheist whose love of money didn’t deter him from taking on commissions with a religious theme – possibly this reflects some prejudice on Vasari’s behalf towards non Florentine painters but makes for a good story nonetheless. Unusually for the time, Perugino lived into his seventies when he was killed in Fontignano by the plague, working on a Nativity and Adoration of the Shepherds in the apse of the Church of the Annunciation (this painting is now in the National Gallery in London). He was buried in the church where he was working, a replica of the adoration is kept there and there is a beautiful Madonna con Bambino on the right hand wall. 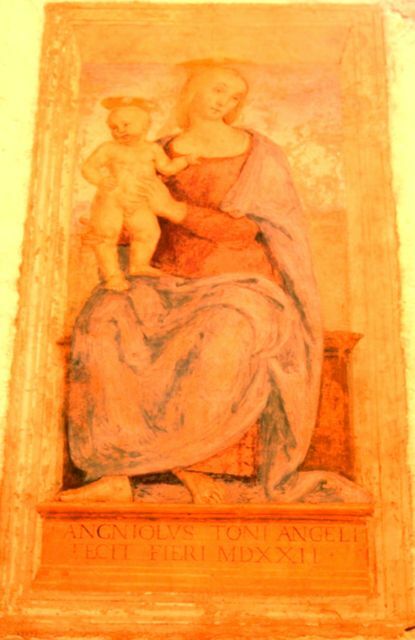 I say beautiful, but in the tradition of these paintings, the Madonna is beautiful but the Child most definitely isn’t! 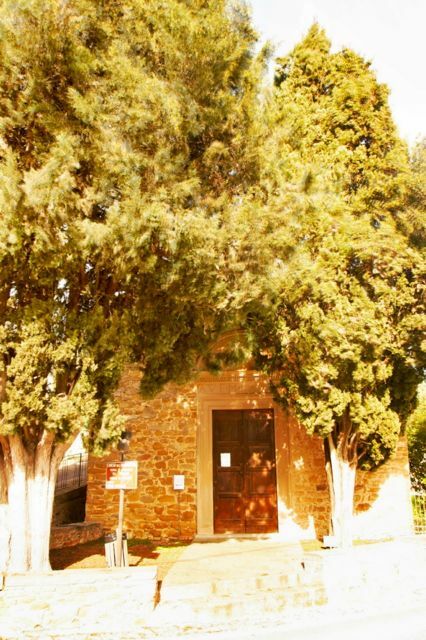 To get into the church, you have to ring one of three mobiles on the door (some Italian needed) and wait for someone to come and open up, the entrance fee is €2. I wouldn’t make a special trip here but, if, like me, you are in the area, it’s a pleasant way to spend 10 minutes.